Plastic recycling is one of the fastest growing areas in extrusion. The ability to reclaim post industrial and post consumer plastic waste, and restore its properties to close to virgin material levels is critical. High resin prices and resin shortages are driving the demand for alternative materials. At EAS, we have experience in all the main equipment areas required to specify a complete plastics recycling facility. Sorting, size reduction, washing, drying, feeding, extrusion, filtration and pelletizing are all key areas within our core technical competence. Whether you need assistance with a single piece of equipment, or an entire recycling plant...we can help! Recycling pushes the limits of your equipment and processes. Each part of the system must do its job, or the entire line suffers. Many technologies exist and more are developed each year for processing of plastic waste materials. EAS will find just the right equipment to fit your needs. Please respond below for a detailed quote, or give us your specific needs, and we will find the right recycling system for you. All systems subject to prior sale. Edge trim reclaim systems. 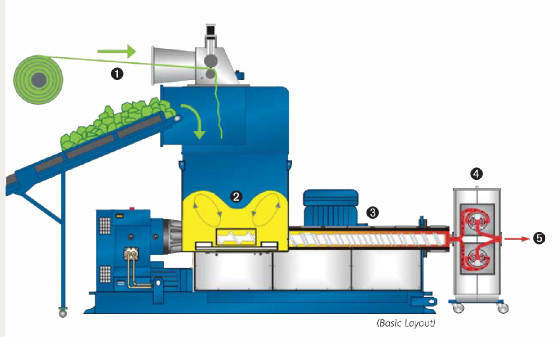 Combination shredder/extruder recycling lines. Washing Systems for LDPE, HDPE and PET. Force fed single and twin screw extruders. Dual diameter extruders. Ram fed, single screw extruders. Dual diameter extruders.